Your computer may be killing you. That sounds like hyperbole but the sad truth is that many people are losing years off of their lives due to improper computer usage 5 Reasons Working With Computers Is Bad For You & How to Stay Healthy 5 Reasons Working With Computers Is Bad For You & How to Stay Healthy Working on the computer may sound like the most relaxed job in the world, but it's quite the contrary. It's very tough on your body, which is not used to this modern type of work.... Read More . Eye damage, spinal issues, muscle atrophy, and weight gain are just some of the problems that may affect you, if not now, then later down the road. Concerned yet? Rest assured that it’s possible to mitigate these effects. All that’s required of you is a small bit of effort – just a few minutes every day. Here are some tools to help you out and make it even easier. A standing desk is perhaps one of the best investments you can make when it comes to preventing computer-induced health deterioration. There’s no denying that a sedentary lifestyle can cause problems, which means sitting is bad for you 4 Serious Health Issues From Sitting Too Long & How To Avoid Them 4 Serious Health Issues From Sitting Too Long & How To Avoid Them When you work at any job that requires long hours sitting at a computer - programming, accounting, writing - it is very easy to stay in that one position for eight to nine working hours... Read More if all you do is sit at a computer day in and day out. That’s why so many of us here at MakeUseOf advocate the standing desk. By standing, you’re forced to use your leg muscles and you’re less likely to have bad posture. Plus, you’re bound to get tired of standing on your feet, which is a natural reminder to walk away from the computer and take breaks. If you think you’d benefit from one, check out these standing desk recommendations 6 Great Standing Desk Designs: Your Backbone Will Thank You! 6 Great Standing Desk Designs: Your Backbone Will Thank You! Sitting can kill you or at least cause serious health issues. Unfortunately, many jobs require us to sit at our desks for many hours a day. Read More . Just be sure to avoid making these standing desk mistakes 5 Things You're Doing Wrong At Your Standing Desk 5 Things You're Doing Wrong At Your Standing Desk Many people, especially those who work from home, are looking to standing desks as the solution for prevention of several serious health issues caused by sitting all day, but not everyone uses it correctly. Read More , otherwise you’ll just be opening yourself up to a different set of problems. Don’t feel bad if you cannot make the leap to a standing desk just yet. Meanwhile, do work on your sitting posture The Basics Of Good Office Posture: An Animated Guide The Basics Of Good Office Posture: An Animated Guide We've said it before, sitting too long kills you. Working a nine to five job in an office, sitting in a chair for 8 hours a day, while staring at a computer screen isn't exactly... Read More . If so, you’re likely straining your eyes. One of the main causes of computer-related eye strain is a monitor that’s too bright with respect to ambient lighting. You may need a bright monitor when the sun is out, but that same brightness is too much when night comes around. F.lux automatically adjusts the color temperature of your monitor according to the time of day. During the day, the monitor is bright. During the night, it dims and turns a slight shade of orange, which is better for your eyes. Because of this, F.lux can help you sleep better Use F.lux To Sleep Better After Late-Night Computer Activities Use F.lux To Sleep Better After Late-Night Computer Activities If you look carefully, most of LCD monitors have a button to automatically change the attributes of the screen to adjust for the types of media which is being viewed. Read More . It works and I highly recommend it no matter who you are. 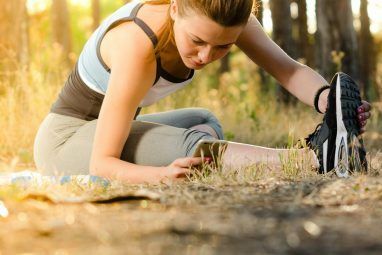 The opposite of “sedentary” is “active,” which means you need to take regular computer breaks and do something that requires motion, such as walking around, exercising, etc. For many people, the issue isn’t so much wanting to take breaks but remembering to take breaks. If that’s you, you’re in luck. Big Stretch Reminder [Windows] is a non-intrusive program that sits in the background and periodically reminds you that it’s time to take a break. You can customize the frequency and length of said breaks as well as the message that appears. If you need a bit more flexibility, you might want to try Breaker instead. Don’t let stress get to you. Computers can make you want to tear out your hair and run away screaming, but they can also help you to relax and regain perspective. Life is busy and life is frantic, which is why you should take time out of your day to sit back and do nothing, even if it’s just for a few minutes. Do Nothing For 2 Minutes is a challenge. 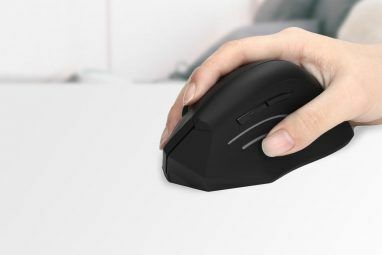 Can you really sit still for 2 minutes without touching the keyboard or mouse? You might be surprised to find out just how difficult this test is. 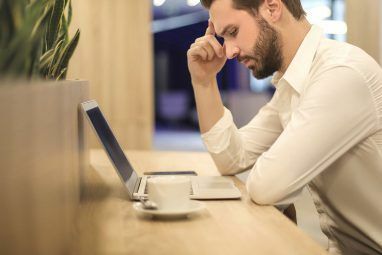 If you really can’t pass it, it might be a good indicator that you suffer from Internet addiction Take A Break From the Internet - You’ll Thank Yourself Later [Opinion] Take A Break From the Internet - You’ll Thank Yourself Later [Opinion] Oh, the Internet. One of the most world-changing inventions of the past century, perhaps even in all of human history. Never before has everything been so available in so little effort for so low a... Read More . Ultimately, if you want to be healthy, you need to live healthy. We’ve discussed ways to make computer use less unhealthy, but the fact remains that prolonged computer use is inherently bad for your health over the long run. If you want to change that, you need to start cutting out the unhealthy bits. There’s no better way to kick your body into shape than by exercising. If prolonged computer use is unavoidable for you (e.g. you work a desk job for 8 hours a day), then exercise at your desk 8 Easy Exercises To Help You Stay Fit At Your Desk 8 Easy Exercises To Help You Stay Fit At Your Desk Staying fit at your desk is actually possible. Here are some exercises anyone can do. Some don't even require getting up, others take no longer than 10 minutes out of your daily routine. Read More whenever you can. But for best results, don’t neglect real exercise. Get started with these YouTube workout channels 7 Best YouTube Workout Channels To Exercise at Home 7 Best YouTube Workout Channels To Exercise at Home Home gyms and personal trainers help the moneyed get up straight from their beds and hit the gym. We lesser mortals have to call on our powers of self-motivation and discipline to trudge the few... Read More for at-home workouts and routines. 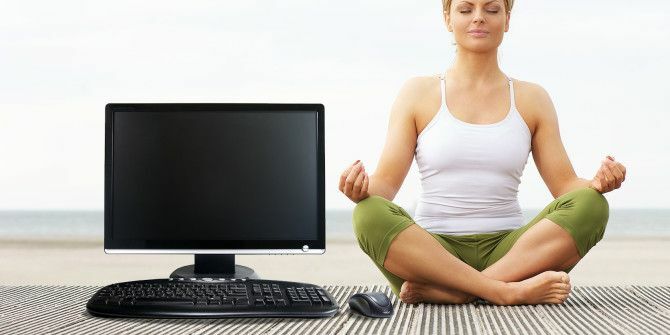 Is your health suffering from poor computer habits? Let us know if these work for you. If you were once unhealthy and have turned your life around, what sort of tips, tricks, and tools did you use to change up your computer routine? Share with us in the comments! ?Work Out & Exercise At The Computer??? I'm an amateur competitive bodybuilder. My resting pulse rate is 52. So.........your sillyass "tips" are gonna make me healthier? Your tips are evidently geared toward pencilnecks and sissies? wow. Internet tough guys are so weird. I recently had surgery on my right arm, nerve entrapment/flattening in large part due to poor positioning of my arm when using the computer mouse. I was resting my forearm below the elbow on the edge of the desk. I go in for my two week follow up this week. I am assuming I should be laying my entire lower arm on the desk? I think either is fine as long as you aren't putting weight on your arms. Ideally, your elbow should be 90-degrees and your forearm should be flat on the desk. Your arms/elbows should not be supporting you. If they are, then you probably need to adjust your seat height or your posture (or both). I'm a bit confused at the need for flux. Is it not sufficient to dim the screen at night? If I'm in a dark room then I will just make it as dim as possible before I even look at it. I guess it's nice if you don't think about it, but when I get the headache or eye pain, my immediate reaction is the dimmer hotkey. Also, I find that I can reduce eye strain by using dark themes for popular sites. I use the Stylish Firefox addon. It's really non-intrusive and automatically applies the theme to the site and all its subpages. Even if a site is relatively unpopular, the first theme that will usually be made for a site is either a dark theme or an ad removal theme. Dimmer light is better than brighter light, yeah, but F.lux doesn't just dim. It adjusts the "temperature" of the light, shifting it away from "blue light" and towards "orange light." Research is still young on the subject, but the hypothesis is that blue light can disrupt circadian rhythms and sleeping patterns. Yes, thanks for the article. I stopped having eye strain problems when I got LED backlit monitors and full-spectrum lighting at my desks, both at home and at work. Mary Brady: YoWindow is a great program, as you describe it. Sadly I could not sit back and do nothing while the horizon on that sunset was so horribly wrong. Can you not almost feel the sea leaking out onto your right foot as you are looking at it.? I would have to spend at least two minutes applying custom fine rotation and cropping and resizing it. I'd also be worrying that F.lux would think it was already too orangey and try to blue it up a bit. Perhaps it would be better as a gif and you could watch the sun set? There's a weather/ desktop program (basic is free) called YoWindow. You can have time of day changes, birds flying, jet trails, etc. It's described as a living landscape which changes according to the weather of the area you have chosen. F.lux has options for other types of lighting, which can change the shading on the monitor's screen.. You do understand that the window w/ the sun icon is only for making setting changes. It is not in view when F.lux is running. Here's the study for anyone interested. In checking my old files, the oldest copy of F.lux setup on my system dates to 9/2011. I've really appreciated this program, recommended it, & updated it as needed. Its extremely useful for those who use their computers at night, after sunset. "Michael and Lorna" deserve a lot of credit for this program. Here's a shout-out to them, for all they do. May you two be rewarded for your wisdom and generosity. Is this where anyone can comment or is it only for the app creators to post very obviously biased nonsense? Very helpful tips. All this are noted. I would share this to others. Hello, I would like to thank you very much for this article and all your tips! I didn't knew F.lux, and it is the kind of program which I was always looking for. I'm absolutely amazed. Thanks so much again! F.lux is amazing. If you use Android, consider using the Twilight app as it provides similar functionality. There are other apps too, like Lux and Velis.